Best Nepal Trekking was established by a team of expert guides and sherpas. They know what it takes to make a trek special and memorable from their years of experience in the Himalayan region and elsewhere. As a result, we always make sure that you get to enjoy a quality trip. 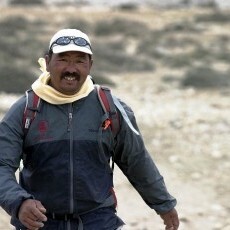 Mr. Dawa Sherpa has been guiding for 35 years in trekking and climbing in the Himalayas of Nepal. He possesses impeccable Mountaineering credentials. Dawa served as the Sirdar for the American Kanchenjunga Expedition and American Everest North Face Expedition. He has worked as a mountaineering instructor at outward bound of Colorado since 1988. He is the founder director of the company. Mr. Chhiree Sherpa is originally from a remote village of Everest region, Nepal. For over 21 years, Chhiree has gathered experiences on adventure related trips, trekking and expeditions. He has taken Extreme high altitude medical training along with many other guiding courses that are recognized by the government of Nepal. He has led various trips all over Nepal and even Tibet successfully. Mr. Sherpa has completed the walk on entire Nepal Himalaya known as Great Himalaya Trail (Darchula to Kanchenjunga) around 2100 KM, the longest trekking trail in the world. Sonam Sherpa is Sales Manager at Best Nepal Trekking (P) LTD. He is young, dedicated and experienced person in the field of trekking over 10 years. Sonam will take very good care of all your inquiries soon as possible. Please feel free to write us for further question regarding your Nepal adventure! Although young, Ngima Geljen has many achievements to his name. He has conquered Mt. Everest 6 times, Mt. Manaslu 2 times, Mt. Amadablam 3 times, Mt.Pumori and Barunste along with many other peaks above 6000m. He has worked with Edviesturs Everest Documentary team in 2010. Mingmar Sherpa is born in the remote village of Solukhumbu (Everest region) and he has many experiences in his career. Mingmar has climbed the world's highest peak; Mt. Everest 4 times including many other peaks as Mt. Putha Hiuchuli, Mt. Amadablam, several trekking peaks above 6000m. He has worked with Adventure consultants for the high altitude expeditions many years and now he is involved with Best Nepal Trekking. Dawa Sherpa is originally from Solukhumbu district of Everest region. He has been working in the tourism field since 2012. He is young and dynamic guide for our company. Mr. Sherpa has taken various training related to the outdoor adventures as first aid training and now certified Trekking guide by the authority of Nepal government.